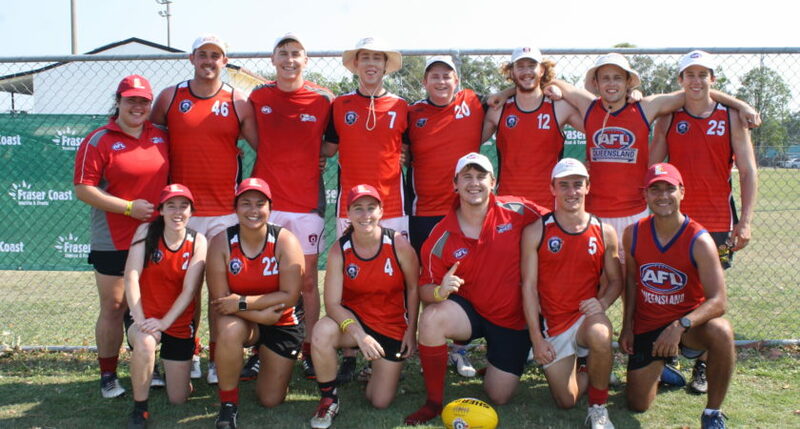 Sweltering conditions painted the backdrop to the inaugural AFL9s on the Bay competition on Saturday, but the intimidating heat failed to detract on what is being hailed as a success. The mercury reached as high as 35 degrees at the Hervey Bay Hockey fields as six teams battled it out for the top prize. In all, six teams – including five from local clubs from across the Wide Bay region and another from Brisbane’s North – took part. In the end, it was the Brisbane North side, comprised of AFL Queensland staff, who claimed victory in the Grand Final against the home-town Hervey Bay Bombers by a slim nine points. The carnival was the first of its kind in the Wide Bay region however the success of the day’s proceedings points toward a bright future for AFL9s on the Bay. Following the tight Grand Final, the six teams came together for the presentation where awards for the days’ play were presented. A new 18 litre esky was awarded to the triumphant Brisbane North side, who gladly accepted the prize before gifting it to the Maryborough Bears, who battled all day through the heat and several injuries to finish the carnival. Hervey Bay Hockey Association representative, Cathy Milly, who helped facilitate the event and presentation, praised the support from all parties throughout the day. Similarly, Chris Wicks – a player in the AFL9s on the Bay, said the community vibe of the event was a major factor of the days’ success. “It was a great day, very easy going and a lot of fun. The weather was hot, but it was a beautiful day for Footy!